Diabetes is a medical condition in which you experience abnormally high blood glucose levels because your body has trouble producing or using insulin. The American Diabetes Association explains that you should limit saturated fat intake and keep sugar intake low, as that can rapidly increase your blood sugar levels. Because many weight lifting supplements contain both of these nutrients, you need to choose supplements carefully and consult a doctor before using any. Many protein bars are high in saturated fat and sugar to overcome the taste of healthy ingredients. However, there are some low-fat, low-sugar protein bars available that may not significantly impact your blood glucose levels. Protein bars such as Doctor's CarbRite Diet bars and Allmax Isofemme bars, which have 6 g or less of fat and 1 g or less of sugar per bar, may support weight lifting because they are high in protein. Both bars use sugar alcohols, which provide fewer calories than sugar and don't cause quick increases in your blood sugar levels. Weight gainers are high-calorie, high-protein supplements that come in powdered form. Unfortunately, many of these weight gainers use sugar and fat to increase the calorie content. Try to find weight gainers that provide fiber and have low sugar and low fat content, such as Cytosport Cytogainer. This supplement contains only 7 g of sugar, 6 g of fat and 4 g of fiber in each 570-calorie serving. 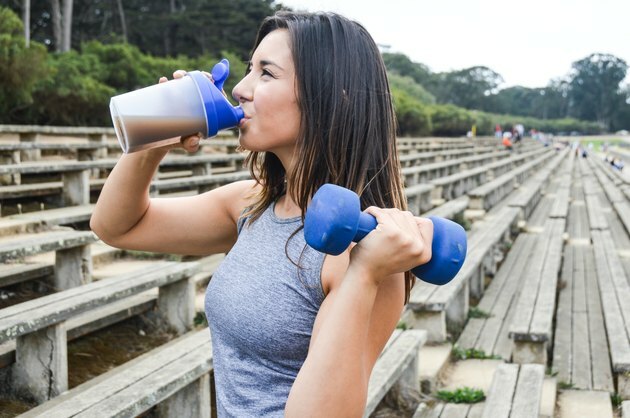 Protein powders tend to contain between 100 and 200 calories per serving, and offer primarily protein and much fewer grams of fat and carbohydrates than weight gainers. However, these powder still may contain added sugars and saturated fat. For this reason, you may want to choose a whey protein isolate, a type of protein powder with very little fat and at least 90 percent protein per scoop. Pre-workout supplements are typically powders that contain amino acids, creatine and caffeine. If you have diabetes, you should use a caffeine-free pre-workout supplement, as a study from the August 2004 issue of "Diabetes Care" found that caffeine may have a negative effect on your body's ability to regulate glucose levels.